Beat and I are winter enthusiasts. That was one of our incentives for moving from the Bay Area to Boulder — I mean, living near big mountains is okay and all, but winter. We weren't going to see the dark, cold, constant barrage of ice and snow that we might find in Interior Alaska. But I envisioned crisp, sunny, glittering snow days similar to those I enjoyed during my youth in the comparable climes of Salt Lake City. Of course it was unrealistic to believe that after three decades of climate change, any winter could resemble my childhood nostalgia. But the winter of 2017-18 effectively never happened. I trained for my Iditarod race by towing a water-jug-loaded cart up and down a dirt road. I rode my mountain bike while wearing shorts up to 10,000 feet on the winter solstice. Beat and I dragged sleds across rocks well above treeline. There were bouts of snow and cold, but they were little more than whispers on the relentless wind. The day before we left for Alaska in February, we got a half foot of snow and temperatures dipped to -11F. "This feels like the first day of winter," I thought at the time. It's far too soon to guess how the winter of 2018-19 will turn out, but it's off to a great start. Our first snow at home come on Oct. 7, and there have been weekly storms since. In the past month I have probably ridden my fat bike through more miles of Colorado snow than the last two winters combined (considering I didn't take my fat bike out even once last season, which I know is a terrible thing to confess.) There have been plenty of warm days, too. Of course I don't mind. 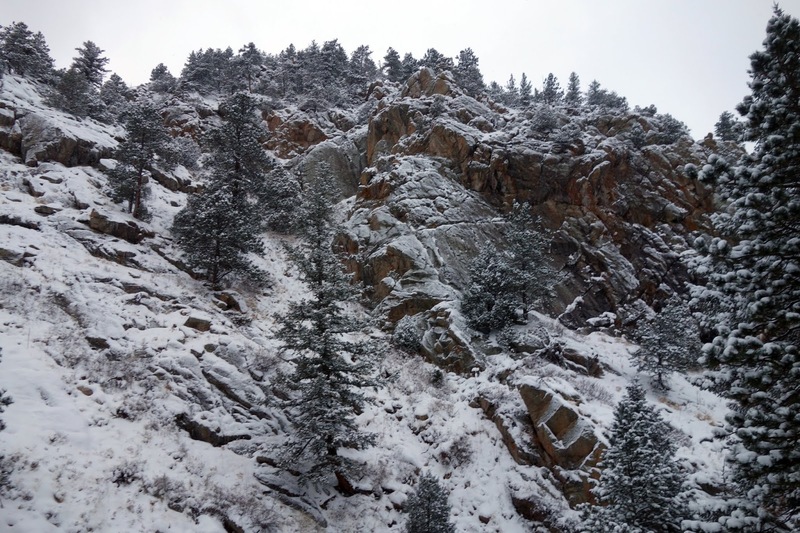 Colorado is its best idiosyncratic self when it's 60 degrees and sunny one day, 15 and snowing the next. We were able to enjoy the 60-degree weather on Saturday with our friend Daniel, who dropped in for a visit and a late-morning run. 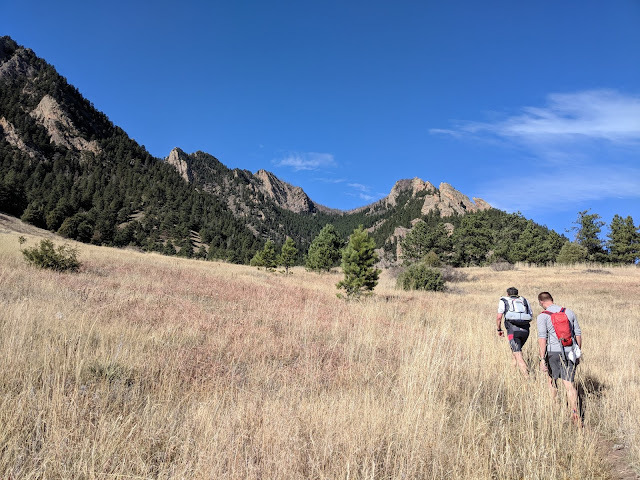 The sun beat down as we descended the rocky trail through Eldorado Canyon, scrambled a climber's access trail, then ascended the grassy foothills toward Shadow Canyon. This grassy section never fails to spark a mild asthma episode ... even now that pollen season is long over and I'm not as allergic to grass as I once was. But it's always like this here. I can sense my airways tightening, like tiny fists, and feel pressure building through each exhalation. This sensation is notably different from my more persistent breathing problems, which is why I don't believe exercise-induced asthma is my main issue. This is just my less frustrating, "grassy field problem." Here I can use my inhaler and instantly feel much better. I wish it always worked that way. Still, besides the short bout of wheezing, I felt refreshingly good on this run. Beat and Daniel maintained a reasonably brisk pace and I was able to keep up with them, at least until they dropped me like a hot rock on the final descent. I think I'm starting to come around. I wish I could be more excited about this, but I fear it's just the upswing in an interminable pattern. 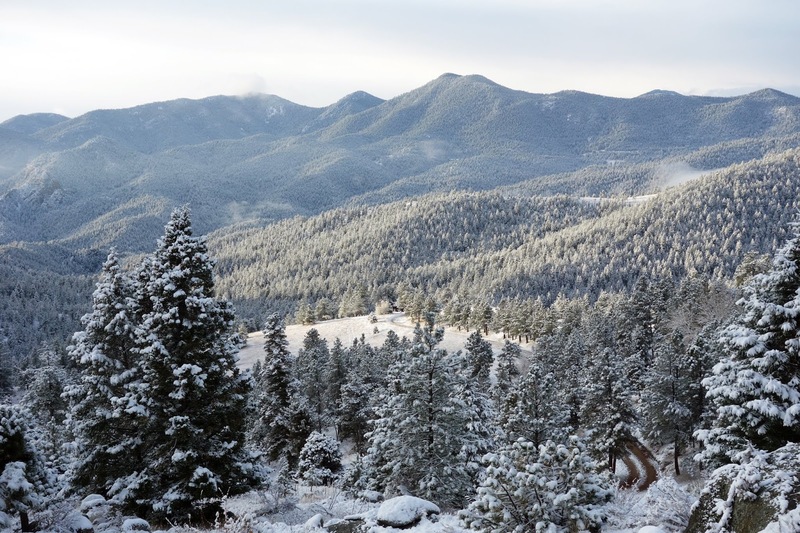 On Sunday we woke up to temperatures in the teens and snow. I love just being at home on days like this — nowhere we need to go, nothing we need to do besides stoke the fire and enjoy the silent dance of snowflakes against a black and white landscape. We did go out for a hike in the afternoon, descending into South Boulder Creek canyon. This is one of my favorite nearby destinations. We didn't stop long, though ... it was 10 degrees and the early evening twilight was rapidly approaching. On Monday, Betsy and I had tentatively planned a mountain adventure. 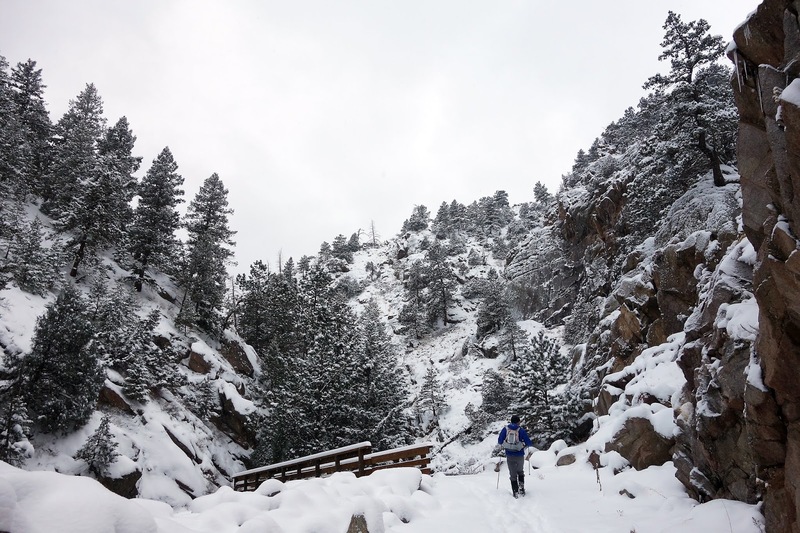 But the timing didn't work out — there was so much new snow that the roads were a mess and trails were likely to be buried. 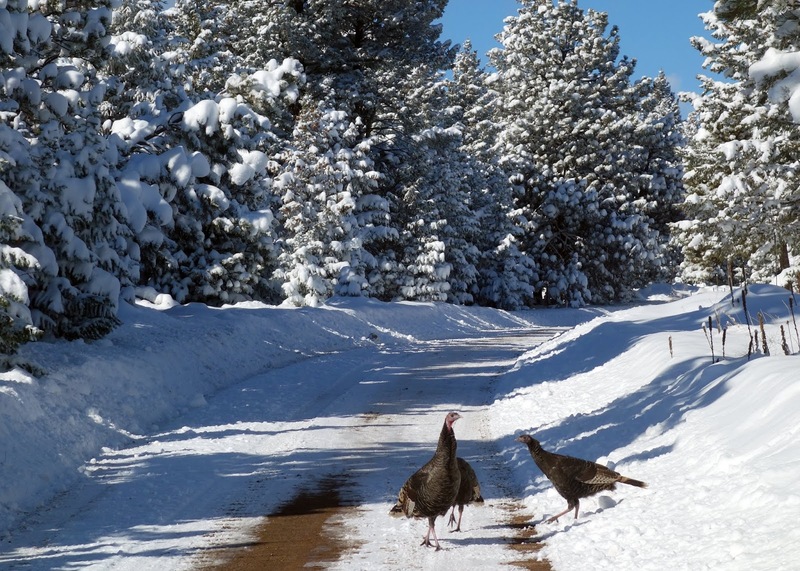 Our official snow total, recorded by the nearest NWS weather station, was 14.2 inches. The Denver Airport only saw two inches and even the local ski hill — 2,000 feet higher — reported eight inches. Clearly, this storm saved the bulk of its goodness just for me. 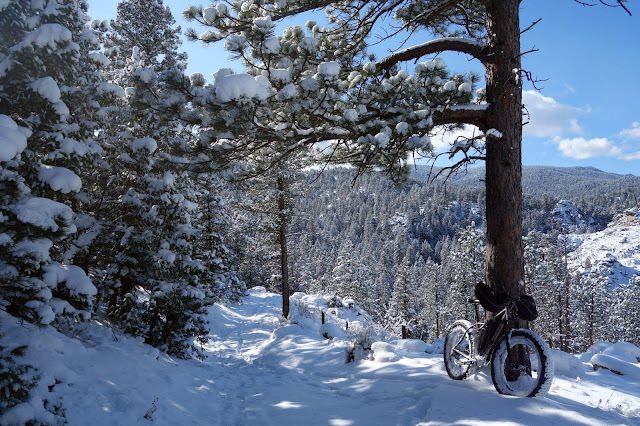 Temperatures were still in the mid-20s, but the harsh Colorado sun was decimating the snowpack quickly, so I set out in the morning before it was all gone. Thanksgiving turkeys on the road. Sampling the trails at Walker Ranch. I took this photo after retreating from my go-to climb, which is sheltered in the shade and held onto a heavy layer of shin-deep snow. 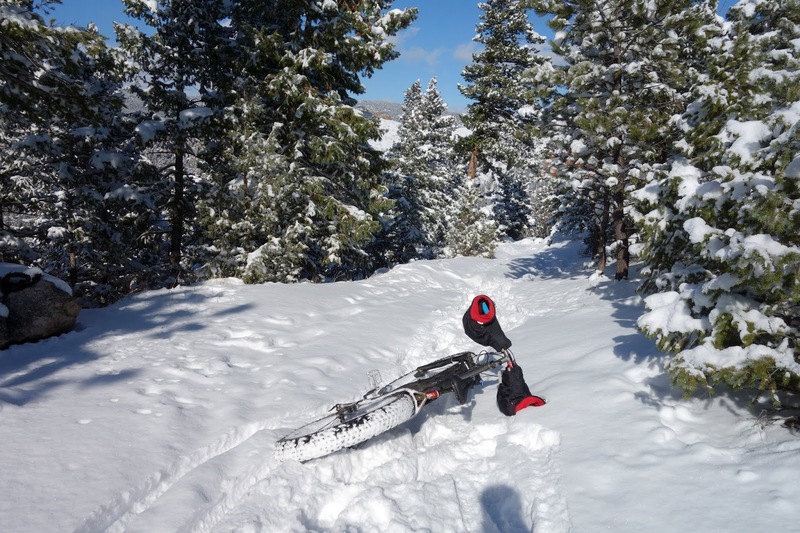 Pedaling near my limit netted maybe two miles per hour, which is one of my favorite aspects of snow biking: So much work, so little reward, which paradoxically becomes its own reward. 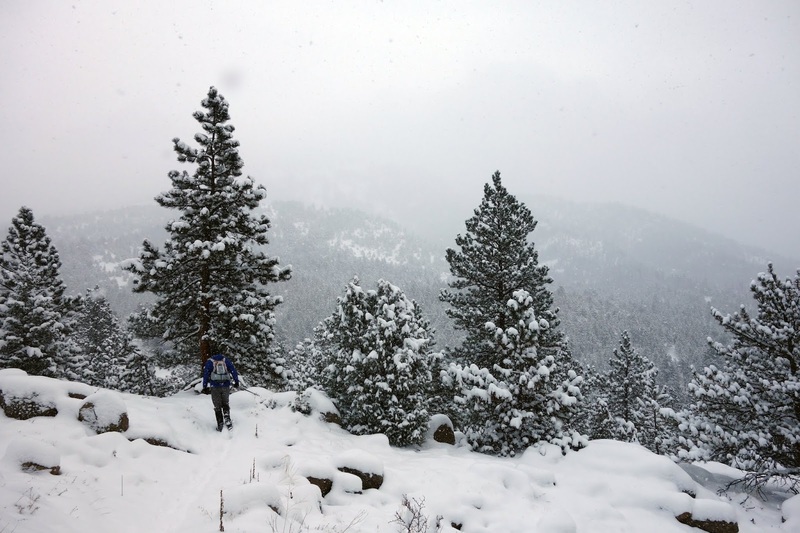 I'd stripped off all of my insulation layers and still managed to drench my base layer in sweat. After about twenty minutes I decided that this glacier pace was perhaps too little reward, and turned around. The descent was steep enough to reel me in with the thrill of speed, then grab the front tire and whip me into the ground. My left elbow absorbed most of the impact, and continued throbbing painfully for the rest of the ride (and is now even more swollen and sore.) Grumble grumble grumble. After crashing I didn't go home right away, even though that probably would have been best. You just can't waste a day like this. It might be the last big snow this season. Who can know? Walker was a huge slog, though. Any uphill required bike pushing with a sore arm. Lots of effort. Some pain. Grumble grumble grumble. Still, it was a gorgeous outing. I was exhausted after 17 miles, and fairly bonked because I wasn't expecting my quick neighborhood ride to take nearly four hours, so I had no snacks. But I did feel strong. I'm trying to harness this feeling to shore up optimism — that it will be a cold, snowy, fierce and strong winter after all. Amazing pictures! Reminds me of my youth, growing up in Wyoming (I recall my brothers and I used to go back in the field behind our house and dig snow HOTELS in the enormous snow drifts...we'd each dig a cave, then start linking them together...pretty soon the entire bank is 'rooms'. Of course we'd be soaked to the bone (wearing 1960's snow gear...pretty pathetic compared to what we have now). I can clearly see in my mind the aftermath of 3 boys coming in from hours in the snow, wet sopping clothes lying everywhere in the back door entryway/laundry room, melting snow and water all over the place...Mom ready with a big batch of hot chocolate (with marshmallows...of course!) ready to hand out as we thaw ourselves on top of the hot air ducts from the furnace...ahh...life was(is) good! Yeah...winters used to be really something! Things really are out of whack these days...fires, storms, tornados, you name it...it is definitely different. Love the story. My sisters and I used to build snow caves in the piles my dad left after hand-shoveling the walkway. It was 1980s gear (moon boots!) and a little less snow, but otherwise quite similar. Ah, nostalgia. Nostalgia might be all we have left of such winters a few decades from now. Ha ha. Yes, I appreciate the "look at my bike leaning against stuff" genre and have participated in it since 2005. Scroll back to any old post in this blog, and you'll see not much has changed. I also don't care about the criticism. It is about "the love." 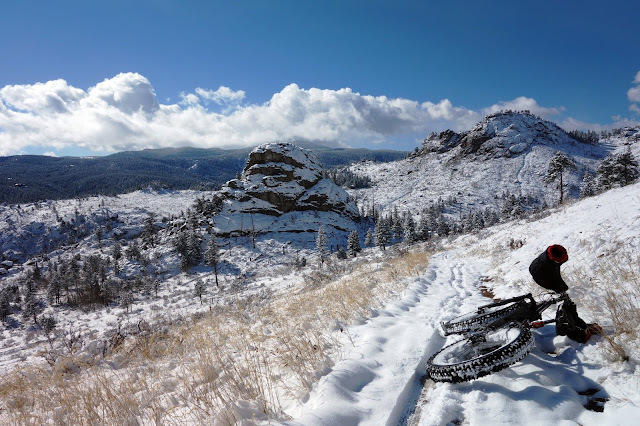 Looking at your fat bike pics in the snow would be one of the only things that could entice me to move someplace like that...when I visit Colo Springs for work in the winter I'm always jealous of the fatbike tracks as I'm killing myself on my old 26" mtb w/ 2.3" tires. 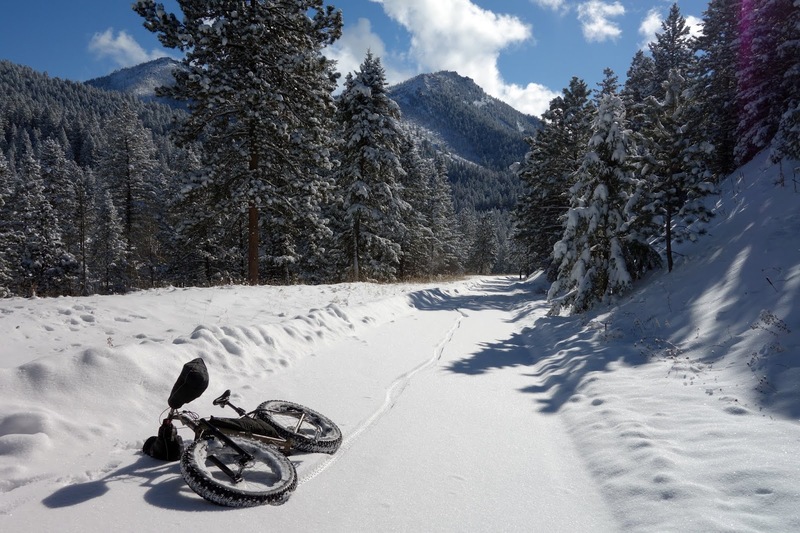 Never ridden one (a fatbike) but I think your Moots would be "the Bees Knees" of adventure bikes. Especially w/ the pogies on the bars (that is what they're called, right?) You and Beat are totally versed and prepped for cold weax fun/exploration...in fact it's your main thing. I'm more prepped for tropical exploration (GRIN!) But w/ the right equipment I could certainly be enticed into the cold (your Xmas trips to Anchorage, and your bike/sled trips to that remote cabin w/ a hot-tub you've talked about...THAT sounds like just plain AWESOME to me! Sadly I'd just get my wife out there...I always kid about me being "tropical"...but compared to my wife I'm Antarctica ready). Sometimes opposites attract. For instance, she has ZERO interest in bikes...not that I haven't tried. You and Beat are so lucky...you enjoy many of the same outside pursuits. ooh...that's supposed to be "Sadly I'd NEVER get my wife out there". No rain at all here in Santa Clara valley in September, October and so far in November. 1st rain is predicted for next week. If I didn't have to drive three to four white knuckle hours to the airport to fly for work I think I'd like winter more. I know we need it though, and I hate smoke, so bring it. Ps. I am not often found without snacks. That's just wrong.